The earth has seen continental drift and plates like Indian from Gondwanaland collided with Asian plate causing Himalaya Mountains. Wegener’s theory was accepted after his death but the cause of drift was not established. The push from gravitational waves on the earth is the only likely force that could have caused this drift over millions of years of the earth’s history. These earthquakes from the plate movements seem to coincide with the ecliptic position when they occur while the gravitational waves pass across at light speed across the pale blue dot of earth in space. The macro earth is modeled by finite elements and subjected to the strains as measured in US Laser Interferometry Gravitational Observatories in 2015 for the first time. The power input from the gravitational waves to the earth is obtained. The three earthquakes reported in August 2016 that occurred almost simultaneously are noted to fall on the ecliptic around that time and one particular quake between Pakistan-Afghanistan borders is presented in detail. The problem of crack initiation and propagation as in metallic structures due to excessive strain is presented that could result in this earth phenomenon. Ever since the ice age ended about fifteen millennia ago man has been constantly thinking of this earth which is home to him along with other life. There have been so much of thinking on this subject of Earth; it’s the scientific revolution in 17th century that provided the first basis on understanding. Newton published in 1687 “Mathematical Principles of Natural Philosophy” and it is probably the most important scientific book ever written. One of the oldest versions is in College of William and Mary, Newton . Einstein [2,3] presented his theory of Relativity: The Special and General Theory. Gravity according to Einstein is distortion in the fabric of Space and time; Matter tells space how to curve; space tells how matter should move. For example as two black holes merge and the energy released, it will emanate ripples of energy more than that of all put together in all stars of this universe in a quick fraction of a second. These gravitational waves, travel at light speed of across the Universe. Matter and energy are two expressions of a single material. We can think of space time as a fabric; the presence of large amounts of mass or energy distorts space time causing the fabric to warp. This warpage is gravity. Einstein introduced gravitational waves that communicate information between two colliding objects (Newton didn’t provide this) about a century ago. This is a problem of action at a distance. Newton looked at gravity as a force proportional to mass of the bodies and inversely proportional to the square of the distance of separation. Einstein looked at the bodies’ influence on the space they are embedded in. The massive body makes a depression in space time fabric around it and enables other body follow its natural path to be attracted to this depression. The Newtonian and Einstein approaches give the same answer when Earth rotates around Sun or Moon rotates around the Earth or as the case of classical Apple falling to Earth. Figure 1 shows the Sun and Earth with its space time fabric, the earth orbits the Sun following the curvature of the local space in the vicinity of the Sun. Einstein’s theory provides for a traffic police man or a signal to inform the traffic movement of cosmic bodies either at speeds below the speed of light as within the solar system of figure 1, or in an expanding universe. The two approaches differ in the case of a very rapid collision, e.g., two stars colliding or a star exploding, Einstein provided in his relativity approach, the transfer of information on the changes in mass distribution and the presence or absence of the stars to the whole Universe. The Universe is full of trillions of stars in each galaxy and there are several trillions of galaxies. In ever expanding universe some of these stars or black holes eventually collide that takes place almost continuously. These colliding waves take energy into space through gravitational waves. They are ripples in the curvature of space time which propagate as waves, travelling outward from the source (Figure 2). They transport energy as gravitational radiation; just as a boat sailing through the ocean produces waves in the water, moving masses like stars or black holes produce gravitational waves in the fabric of space time. A more massive moving object will produce more powerful waves, and objects that move very quickly will produce more waves over a certain time period. They pass through the earth continuously. The two Ligo detectors detected second time within three months on Christmas day December 25, 2015 gravitational waves from the inspiral, as the decaying mutual orbits of two bodies and merger of two black holes , one was 8 and the other 14 times the Sun’s mass, merging to form a black hole with 21 solar masses. This was announced on 16th June 2016. It is worthwhile to note that several minor earthquakes were reported, see Earthquake report  in India, Indonesia, Afghanistan, China, Guam, USA almost at the same UTC, on the day when gravitational waves were measured on 14th September 2015. 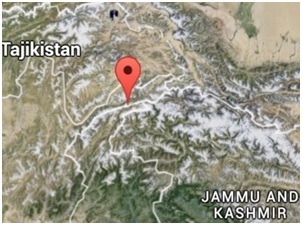 Also several earthquakes were reported on 25th December 2015 in Ashkasham (Eshkashem), Afghanistan, Muzaffarabad, Pakistan (Figure 3) on the day of reported second measurement. Last year in 2017, the third Ligo Virgo in Italy began operating and measured third gravitational waves on August 14, when two black holes merged 1.8 billion light-years away, their violent union sent shock waves through space, time and Earthquake report 14th August 2017 with the quakes in Pacific-Antarctic region amongst others; there were two significant earthquakes that were of magnitude 5 amongst several minor ones . A fourth gravitational wave has been detected from the same Ligo on Sep 27, 2017 . On the same day earth quake reports were given in Indonesia and New Zealand amongst others . The relevance of gravitational waves was quite obvious the missing and convincing energy required for continental drift theory as pronounced by Wegner is from the collision of cosmic bodies and expanding universe [14,15]. The slow drifting of the continents over hundreds of millions years is with the help of the energy passed on by gravitational waves. This continuing drift of continental plates is the main reason for earth quakes caused by one plate jutting against another plate and forming mountains such as Himalayas in this process. This paper deals with the energy received by earth from the measurements of Ligos resulting in earthquakes. Hubble  has shown that the universe is always expanding and that all distant galaxies were receding from the Earth. He demonstrated that the larger the redshift, the greater the distance is to the object. Since it is known that angles (apparent sizes of objects on the sky) decrease as one move an object farther away, smaller appearing objects must be farther away. Hubble's Law says that the recession speed the redshift observed is proportional to distance of celestial object from the earth. Figure 4 shows these observations. If one interprets the red shift as due to motion, Hubble's Law can be restated in its familiar form as shown in figure 4. However the red shift measured for distant galaxies is primarily due to the expansion of the universe, and not to what are called peculiar velocities. An approximation to the red shift driven by the expansion of the universe is found to be v ~ cz when v is much smaller than cz or in figure 4a, where, c is the speed of light, 300,000 kilometers per second. The distant objects move away faster as in figure 4b. This shows that the distant objects after collision are not visible in an expanding universe when the gravitational waves travel opposite to the expansion direction. Wall reports that the universe is expanding 5 to 9 % faster than thought earlier . The current observation on September 15, 2015 is from the collision of two black holes located in the southern hemisphere and in this expanding world the northern hemisphere collisions do not reach the earth. All the collisions occurring in the southern hemisphere go past the earth and transfer their energy to the earth, smaller or larger in strength. The gravitational	passing the earth all comes from southern celestial hemisphere. This means that the gravitational waves pass the earth in a direction normal to the ecliptic, the path of the earth around the Sun. The apparent path of the Sun on the celestial sphere is defined as Ecliptic and provides the basis for the ecliptic coordinate system. It also refers to the plane of this path, which is coplanar with the orbit of Earth around the Sun (and hence the apparent orbit of the Sun around Earth). The path of the Sun cannot be noticed from Earth's surface because Earth rotates, carrying the observer through the cycles of sunrise and sunset, obscuring the apparent motion of the Sun with respect to the stars. 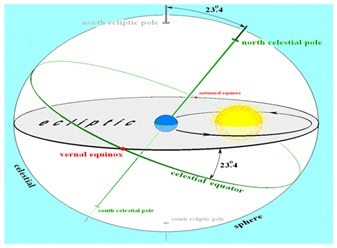 The earth’s path around the Sun, the ecliptic is shown in figure 5, [18,19] The north and south ecliptic poles normal to the ecliptic are shown in the celestial sphere. The celestial equator and the north celestial and south celestial poles normal to this are also given in figure 5. The ecliptic makes an angle 23.4o with the celestial equator, i.e., the ecliptic poles make an angle 23.4o with celestial poles. The equinoxes are the intersection points of the ecliptic and celestial equator. The vernal and autumnal equinoxes are marked in figure 5. Figure 6 shows the Ecliptic in March Equinox. Here the celestial poles are shown vertical with the autumnal and vernal equinoxes and summer and winter solstices are marked. If the gravitational waves pass through the earth normal to the ecliptic in March and that they are strong enough can make the tectonic plates slide against each other by virtue of the strain, i.e., displacement normal to the waves imposed on the earth. The Pangaea is likely to have been driven by these displacements caused by the energy in the gravitational waves transferring to the earth, albeit slowly over three hundred million years; the last one being Indian subcontinent that has rammed into Asia, creating the Himalayan ranges and others. The earth quakes recorded in 2012 are shown in figure 7, Earthquake report  and they all fall around the ecliptic positions throughout a year. It has been shown that whenever gravitational waves are recorded in recent times (and published just four) there have been earthquakes as well. This may lead to a proposition that it is the energy from gravitational waves pushing the continental plates and causing earthquakes as proposed by Wegener . The moving tectonic plates and jutting against each other produces earthquakes. It is well established in Earth Sciences, Fowler  that the forces responsible for such drift have to do with convection currents inside the mantle. The source of energy can be now attributed to the observations of the earthquakes occurring after the passage of the gravitational waves. It could be also pointed out that earthquakes can be triggered by tidal forces of the Earth-Moon system, where only a tiny increase in stress along the fault can result in brittle failure of the rock. In this sense, it may be likely that small stress perturbations produced by gravitational waves may also have a similar effect. Rao discussed the earthquakes that have occurred and attributed them to myths in ancient times and to energy passed on to earth from gravitational waves [22,23]. An earthquake occurs with an epicenter around the geometry of the earth, just like a metallic structure fails in fatigue with peak stress exceeding local strains that go into plastic region . Therefore a finite element model is built to study the topography around the epicenter of an earthquake. The strain recorded in Hanford, Washington and Livingstone, Louisiana Ligos on 14th September 2015 is shown in figure 8. This means amplitude of 10-21 strain acted on the earth for a period of 0.05 seconds due to passing of the gravitational waves at speed of light. The amount of energy passed by the gravitational waves to the earth can be determined from today’s technological advances of Simulation Based Engineering Science [25,26]. Though Earth is a tiny dot in space, it is big or macro size for the humans. No one made a finite element model of this huge earth and it is necessary to make this model to determine the influence of such a small strain that can cause disaster for the macro size earth. The way in which such a model is worked out is given below. Figure 9 shows the details of earth for making the finite element models, which are as follows. Earth’s radius 6.371 million meters is too large for any software that is developed for structures of common occurrence. Therefore it has to be down-sized. Using a scaled down model by a factor of million, the CAD model obtained is shown in figure10. The scaled down model with its different dimensions is given in figure.11. 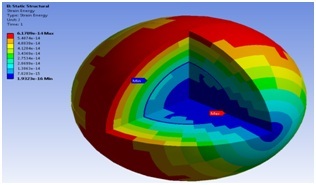 The meshed model or Finite Element Analysis (FEA) model is shown in figure 12. It has 9944 solid elements with 9841 nodes. The strain amplitude for the purpose of calculation is taken as 1 part in 1020. The earth stretches and compresses with this minutely small strain level at a frequency 10 Hz. The gravitational wave goes down at speed of light. Therefore, the strain is taken to be a constant and applied at all the nodes of the earth. 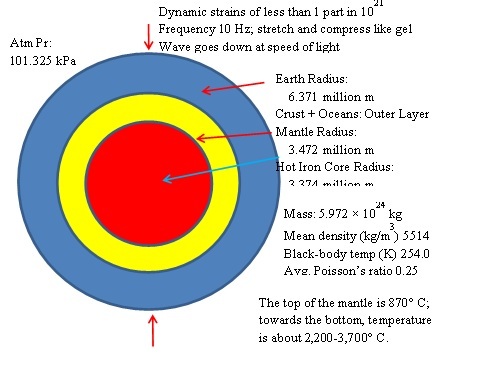 The magnitude of the strain however, needs to be corrected so that the scaled down model produces the same strain energy as the original earth. This modification factor is first derived. Let the model be scaled in all dimensions by a factor f so that the dimensions now are fx,fy and fz. The problem is about the strain to be applied on the scaled down model to give the same strain energy of the original model. Young’s modulus E is kept same in both the models. In the original model the strain energy is proportional to and the scaled down model the strain energy is where ef is the strain factor to give the same strain energy in both the models. 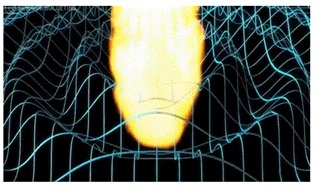 This input strain is applied to all the elements in figure 12. We need Young’s Modulus E for determining the strain energy in equation (1). The earth is a complex anisotropic body, for simplicity it is assumed to be = 200 GPa. The results obtained for the strain energy are shown in figure 13. The total strain energy is obtained by integrating over all the elements and shown in figure 14. The strain energy integrated thus over the volume = 1.45×10-10J, Rao and Shiva Kumar . The three Earth Quakes that occurred on 16th April 2016 with Epicenters falling on a circle close to the Ecliptic of March-April is shown in figure 15. If strong gravitational waves are moving across the earth at this time from the southern hemisphere as was observed on four occasions reported they are most likely to have caused the earth quakes. Measurements on 16th April 2016 were probably not made or the status is not published. 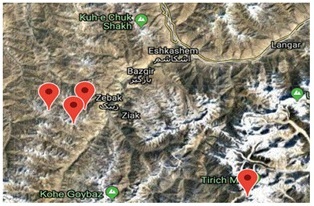 One of these earthquake details between Pakistan-Afghanistan borders in a gorge was sufficiently available to make suggestions on Fracture in Himalayas that is probably responsible for this earthquake. One of these three earthquakes with magnitude 7.8 occurred near Esmeraldas, Ecuador as shown in figure 16. 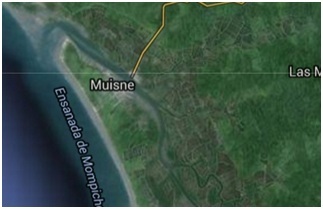 The epicenter was centered 27 kilometers south-southeast of Muisne, a sparsely populated area of fishing ports that's popular with tourists. In figure 16(b) the nearby mountainous area that steeply fell down to the Pacific Ocean where the earth quake took place is shown. The epicenter location is shown in figure 17 in a 3D view. Ecuador is generally mountainous region; the epicenter occurred near what we call as a discontinuity where strain gets amplified, Rao, Narayan, and Ranjith for a study of metallic structures with discontinuities . The epicenter location is shown in figure 17 and the strain is measured in plain grounds of a Ligo gets several hundreds or thousand times magnified making the tectonic plate movement easy and creating an earthquake. Similarly an earth quake of 4.6 magnitude occurred in region of Afghanistan-Pakistan border 70 km from Pārūn, Nūrestān, on the same day, April 16, 2016 at 02:10 AM as shown in figures 18 (a,b) shows the steep mountainous area with the river in the gorge where the earthquake epicenter lay. The magnitude of earth quake is smaller here as the discontinuity is somewhat smoother in figure 18. Lastly on the ecliptic on the same day Kumamoto Prefecture on Kyushu Island suffered a quake of magnitude 7.3 at a depth of 11 kilometers on 16thApril as shown in figure 19. Why three different earthquakes occurred on the same circle of ecliptic as far away from Esmeraldas, Ecuador to Kumamoto, Japan via Himalayan ranges; surely they must be one way or other related. They are probably related to the gravitational waves passing through in a normal direction to the ecliptic originating from the southern hemisphere just as the ones recorded on four other occasions. Their intensity is higher depending on strain concentration factors based on the severity of the discontinuities existing at these locations with their tectonic plates yielding causing these earth quakes. The gravitational waves coming from the southern hemisphere have also been responsible to break up Pangaea nearly 300 million years and bring the earth’s continents to the present positions. It may be noted that orogeny from volcanoes is a different geological phenomenon altogether. The volcanoes provide the required energy for the earth to suffer a quake. Just like earthquakes that occurred on April 16th there are three earthquakes on August 24th 2016. This time it is around September equinox time with three earthquakes 1. Cittareale, Latium, Italy epicenter 7 km depth, 2. 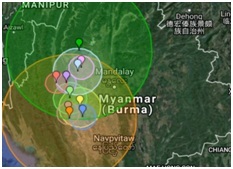 Chauk, Megway, Myanmar, 6.8 magnitude 84 km depth and 3. 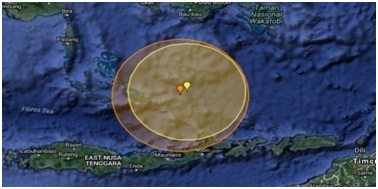 Maumere, East Nusa Tenggara, Indonesia, 6.0 magnitude, 532 km depth. They are given in figures 20-22 respectively. These three earthquakes fall on the Ecliptic of September equinox as shown in figures 23 and 24these three earthquakes similar to the three earthquakes falling on the Ecliptic of March equinox presented before. The stress is uniform in a structural member if the load applied is uniform and that the structure is smooth without any changes in dimensions, e.g., a plate applied with uniform stress at the edges in tension. The stress raises or concentrates at a location called stress raiser. The member is strongest when force is evenly distributed over its area, so a reduction in area, e.g., caused by a crack, results in a localized increase in stress. The earth is also like a structural member and fails via a propagating crack, when a concentrated stress exceeds the fracture strength of a material. Most materials and earth, especially where tectonic plates meet and collide contain small cracks that concentrate stress. Fatigue cracks always start at such stress raisers, and in the present context generate earth quakes. A typical example is a turbine blade with a discontinuity in the geometry where a crack can initiate because stress raiser exists here. 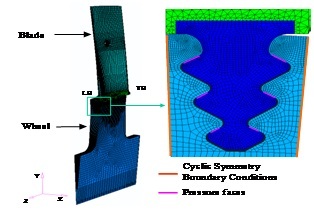 This is shown in figure 25 with a sector of the disk with one blade using cyclic symmetry boundary conditions applied on both the partition surfaces. The common nodes on the pressure faces where the load transfer between blade and disc takes place are joined together to make it as a single entity. The blade and disc are assumed to be made up of same material with Yield stress of 585 MPa, Young’s modulus 210 GPa, density 7900 kg/m3 and poisson’s ratio 0.3. Elastic stress analysis is carried out for centrifugal load at 4000 RPM. Figure 26 shows the Von Mises stress distribution obtained. The peak stress observed is 404 MPa in the root fillet of the blade as shown. The stress raisers considered here are all in elastic region and relatively lower. Where a crack is present the stress goes into plastic region as shown in figure 27, . Theoretically at crack tip, the stress is infinity, even though the stress field is grossly elastic. There is a small plastic zone close next to the discontinuity like a notch or a crack, surrounded by an elastic zone as in figure 27. Neuber has shown that at a discontinuity when the stress is in the plastic region one has to determine the theoretical stress concentration factor by recognizing that strain concentration exists . The crack tip stress can then be determined by using the surrounding elastic fields. In the above is the surrounding elastic field stress range, and true stress and strain ranges, K' is cyclic strength coefficient and n' is the cyclic strain hardening exponent. can be determined by a finite element analysis and the true stress and strain ranges are determined by an iteration process. However, the exact geometry where earthquake occurred is not known and therefore the CAD models cannot be made and this approach cannot be exactly adapted. We also do not have the strain range value of gravitational waves on 16th April 2016. Though the geometry is not known, the approach can be outlined here. We take figure 18b to propose the model here in figure 28. A cross-section A-A looking from right is given in figure 29. Rotating figure 29 counter clockwise by 90o we get the case of a turbine blade notch which received considerable attention. This is given in figure 30. The overlapping thrust faults in Himalayas are as shown in figure 31. The main central thrust here is a major geological fault where the Indian plate is pushing under the Eurasian plate over tens of millions years forming the Himalayas. The Indian Plate moved from south over the last last 70 million years and continues to push the Eurasian plate as mentioned before by the influence of gravitational waves. Figure 18, where the earth quake location is depicted and is located in one of the faults formed as shown in figure 31. The earthquake on 16th April can be attributed to the thrust provided by gravitational waves from south to north. Cracks already exist as shown in figure 31 and they can propagate. A crack initiates at the peak stress region, once it initiates, it very quickly propagates and fracture is almost instantaneous. 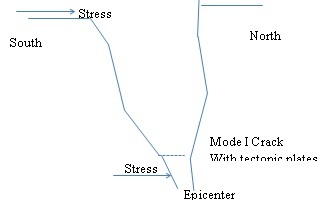 The peak stress region is in high stress concentration zone and that is where from the cracks propagate. The threshold value of alternating stress is quite small for crack propagation and can propagate quickly causing the earth quake . Generally cracks propagate in what is called Mode I, once the threshold value for propagation is reached. Comparing figures 26 and 30, as in figure 32, we can say that the crack opens in Mode I whenever there is a thrust from the gravitational waves. Once a crack is initiated, in this case Himalayan Thrust Faults, the crack propagates according to Paris law in metallic components [30,24]. In the present case, the notch is like a crack tip, and the stress value here is infinity. We have no clear information on the crack tip in the case of earth quakes in the tectonic plates under thrust faults; however given the huge sizes in figures 28 and 31, we can see that large stresses are produced under the thrust from gravitational waves such as those occurred on April 16. Under this oscillating thrust force, as measured in a Ligo in figure 8, the tectonic plates move further suddenly, causing an earth quake. It will be interesting to work on a relation between the depth of Earthquake and strain value once it is measured or available in a Ligo measurement through simulation as shown in figure 30. However we need the measured topography of the landscape as in figure 18, which is not available currently. The following conclusions may be drawn from this study. I am deeply indebted to my students spent over nearly six decades in the world keeping me inquisitive of scientific developments taking place around. I am very deeply thankful to my teachers from Schools to IITs to give me an insight to Science and Mathematics which stands even till date relevant. Weddington D (2014) Principia Mathematica - Newton's Principia. Earl Gregg Swem Library, College of William & Mary, Virginia, USA. Einstein A (1917) Kosmologische Betrachtungen zur allgemeinen Relativitätstheorie. Sitzungsberichte der Königlich Preußischen Akademie der Wissenschaften (Berlin), Berlin, Germany. 1: 142-152. Einstein A (1920) Relativity: The Special and General Theory. Methuen & Co Ltd, London, UK. Reitze D (2016) ‘We did it!’ Scientists announce discovery of gravitational waves-video. Guardian News and Media Ltd., UK. Livingston DM (1974) The Master of Light: A Biography of Albert A. Michelson. Physics Today 27: 54. Chu J (2016) Q&A: Rainer Weiss MIT physicist developed the concept for LIGO as a teaching exercise, MIT News Office, USA. Thorne K, Weiss R (2016) A brief History of LIGO. Caltech, California, USA. 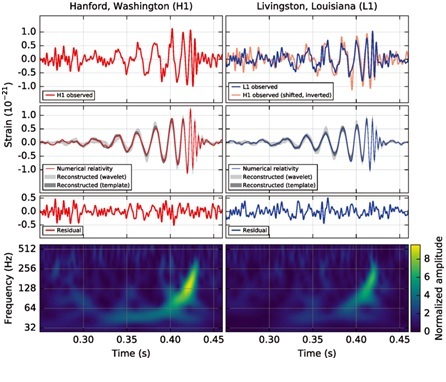 Cole B (2016) Ligo has Detected Gravitational Waves for the Second Time. Wired, USA. 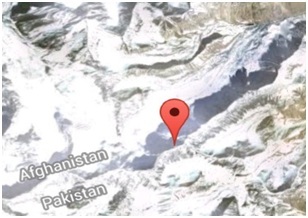 Vervaeck A (2015) Very Strong earthquake - Ashkasham, Afghanistan on December 25, 2015. Earthquake-Report, USA. Volcano Discoveries (2017) Earthquake report world-wide for Monday, 14 Aug 2017. Earthquake report world-wide. Volcano Dis­coveries, Germany. Volcano Discoveries (2017) Earthquake report world-wide for Wednesday, 27 Sep 2017. Earthquake report world-wide. Volcano Dis­coveries, Germany. Guarino B, Kaplan S (2017) Gravitational wave from black hole collision 1.8 billion light-years away sensed in U.S. and Italy. The Washington Post, Washington DC, USA. Wegener A (1912) Die Entstehung der Kontinente. Sophia Rare Books, Kingdom of Denmark 58. Wegener A (2002) The Origins of Continents. Int J Earth Sci (Geol Rundsch) 91: 4-17. Hubble E (1929) A relation between distance and radial velocity among extra-galactic nebulae. PNAS 15: 168-173. Wall M (2016) Surprise! The Universe Is Expanding Faster Than Scien­tists Thought. Space.com, New York, USA. Nautical Almanac Office (2010) Almanac for computers. Nautical Almanac Offi	ce, United States Naval Observatory, Washington, USA. Daniell J, Vervaeck A (2012) Damaging Earthquakes Database 2012 – The Year in Review. SOS Earthquakes and Earthquake report, Belgium. Fowler CMR (2004) The Solid Earth - An Introduction to Global Geophysics (2ndedn). Cambridge University Press, London, UK. Rao JS (2018) Earth's Sustainable Energy in the Universe - Fusion as in the Sun. Journal of Energy and Environmental Sustainability 5: 8-18. Rao JS (2018) This World is full of Vibrations. Plenary Lecture, VETOMAC-XIV, Instituto Superior Técnico, Lisbon, Portugal. Rao JS (2000) Turbine Blade Life Estimation. Alpha Science International Limited, Oxford, UK. Rao JS (2017) Simulation Based Engineering in Solid Mechanics. Springer Publication, Berlin, Germany. Rao JS (2018) Creativity in design–Science to engineering model. Mechanism and Machine Theory 125: 52-79. Rao JS, Kumar P (2016) Gravitational Waves and their Effect on Earth’s Temperature. NAFEMS Congress. Rao JS, Narayan R, Ranjith MC (2010) Lifting of Turbomachinery Blades – A Process Driven Approach, Advances in Vibration Engineering, Journal of Vibration Institute of India 9: 71. Neuber H (1961) Theory of stress concentration for shear strained pris­matic bodies with arbitrary nonlinear stress strain law. J Appl Mech 28: 544-550. Rolfe ST, Barsom JM (1977) Fracture and Fatigue Control in Structures: Applications of Fracture Mechanics. ASTM International, Pennsylvania, USA. Pg No: 562. Figure 1: Sun and Earth in space time fabric of Sun. 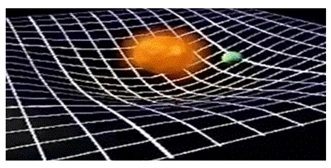 Figure 2: Gravitational waves that communicate information across space time. Figure 3: Earthquake on Christmas day 2015 in Afghanistan. Figure 4a: Recession speed is lower when the object is closer. Figure 4b: Recession speed is higher when the object is far away. Figure 4: Hubble Law in an expanding universe. Figure 6: Ecliptic in march equinox. Figure 7: Earthquakes in 2012. Figure 8: Strain records and frequency as a function of time on 14th September 2015. Figure 9: Full scale model of earth. Figure 10: Scaled model of Earth by a million. Figure 11: Scaled Model with its segments. 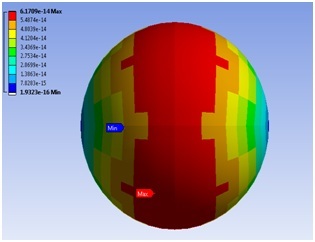 Figure 12: Finite element model of scaled-down Earth. Figure 13: Strain energy plot of the earth. Figure 14: Strain energy integrated. Figure 15: Earth Quakes that occurred on 16th April 2016 with epicenters falling on a circle close to the ecliptic of March-April. Figure 16: The earthquake with magnitude 7.8 near Esmeraldas, Ecuador. 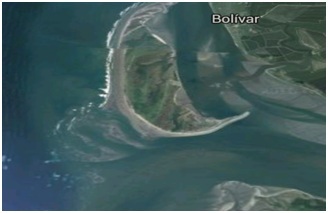 Figure 17: Epicenter location around bolivar. Figure 18: Afghanistan earth quake. 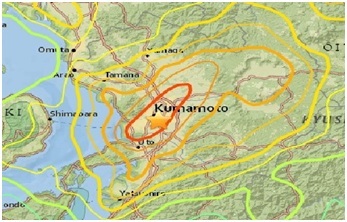 Figure 19: Kumamoto prefecture earth quake. 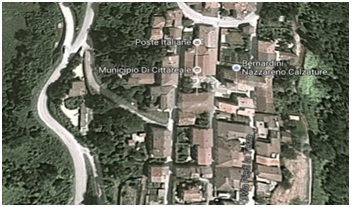 Figure 20: Cittareale, Latium, Italy. 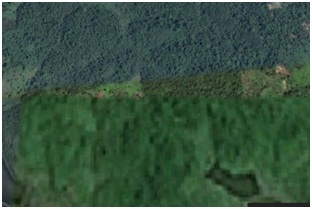 Figure 21: Chauk, Megway, Myanmar. Figure 22: Maumere, East Nusa Tenggara, Indonesia. Figure 23: Three earthquakes on 24th august 2016 and their locations. 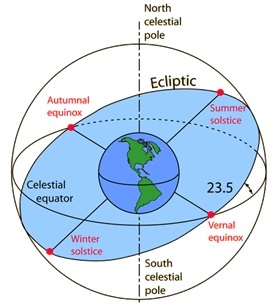 Figure 24: Ecliptic in September equinox. Figure 25: Bladed disk model showing the fe mesh. Figure 26: Von mises stress distribution. Figure 27: Crack tip plastic zone. Figure 28: Plan view of figure 18b. Figure 29: Section a-a looking from right. 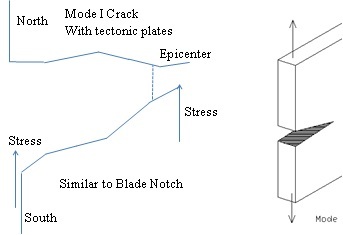 Figure 30: Earthquake topography looks similar to a turbine blade notch in figure 5. 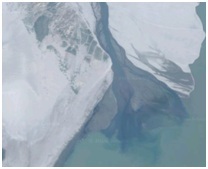 Figure 31: Himalayan overlapping thrust faults. Figure 32: Himalayan thrust faults open in mode I.
Citation: Rao JS (2018) Finite Element Modeling of Earth and Earthquakes from Gravitational Waves. J Atmos Earth Sci 1: 004. Copyright: © 2018 Rao JS. This is an open-access article distributed under the terms of the Creative Commons Attribution License, which permits unrestricted use, distribution, and reproduction in any medium, provided the original author and source are credited.